Sector Fund – Should you invest? Before you start reading about sector fund – I would like to tell you clearly that this is the riskiest category in mutual fund. Time to time few of the sectors have given phenomenal returns but end of the day losers are more than winners when we talk about investors. My suggestion is they should never be part of your core portfolio but depending on the individual you may think about this in your satellite portfolio. 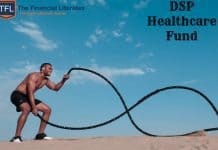 In this article I have covered what are sector fund, best sector funds, benefits & risk associated with them and finally should you invest in sector fund. First understand what diversified equity mutual funds are. Diversified funds are the funds which don’t have any restriction on particular theme or sector. Or we can say diversified funds invest in different sectors like banking, information technology, pharma, power, FMCG etc. If I talk about Indian stock market it is divided into 56 broad sectors. So if you want to take advantage of entire market, you would look for a fund which is democratic when it comes to choosing a stock for the portfolio. Let’s see sector allocation of a diversified equity fund. 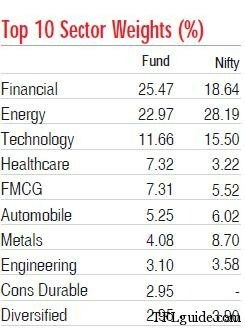 This is a large cap fund & you can see its top ten sectors – you can also see it’s comparison with nifty composition. Now a classic example from a foodie. Once I was on a training to Hyderabad, and before going I was very happy as I thought I will eat only Biryani, which I was really fond of. Moment I landed in Hyderabad, I started my expedition of eating Biryani’s. I tasted Biryani at all places including the gali behind Char Minar and the thela outside the Salarjung. Although the training was supposed to be for 10 days, I had to rush back home on the 8th day as I was sick and my throat caught an infection as I was eating too much of spices. Was I wrong? I was a Biryani lover and now if it is served in a buffet, I feel vomiting. So now without even writing what are sector funds you must have guessed what these are? Sector funds are those funds which invest in particular one sector. Like funds dedicated to Information Technology or Banking. There is very low diversification as they are taking concentrated bets on a single sector or 2-3 main sectors. This is list of top 10 equity funds of last 3 years – total equity funds 383. 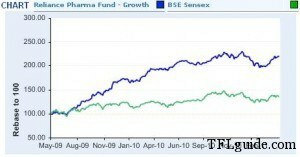 (25th May 2011) You can clearly see 7 funds out of 10 are sector fund or theme fund. So should we read more about it? Yes. If you are sitting in the right sector & that particular sector performs – your fund will substantially rise. This will give boost to your overall investment. Take example of Reliance Diversified Power Sector Fund – if you invested in 2004-06, it would have given additional return of 1-2% to your investment portfolio. Check comparison graph between Reliance Diversified Power Sector Fund & Sensex. The vice versa of the above mentioned benefit is also there. 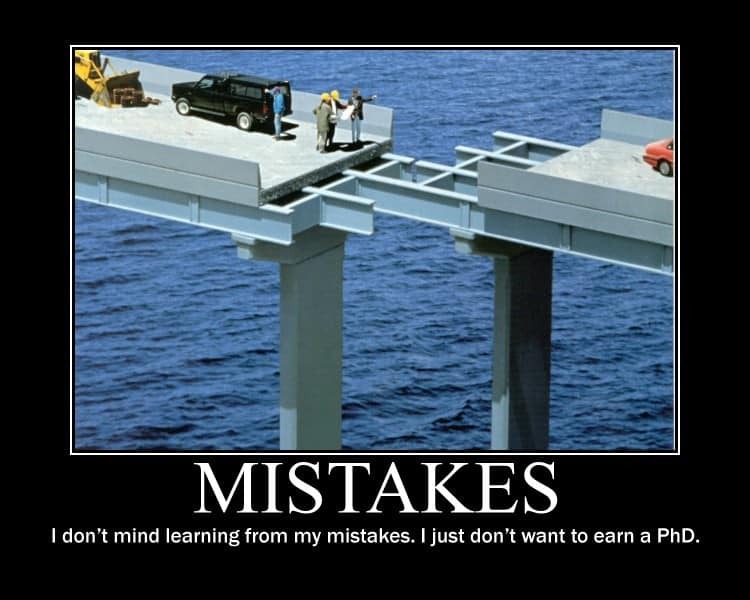 The benefit of higher return turns into risk if you are sitting in wrong sector & at the wrong time. There can be substantial losses which will pull back your portfolio. 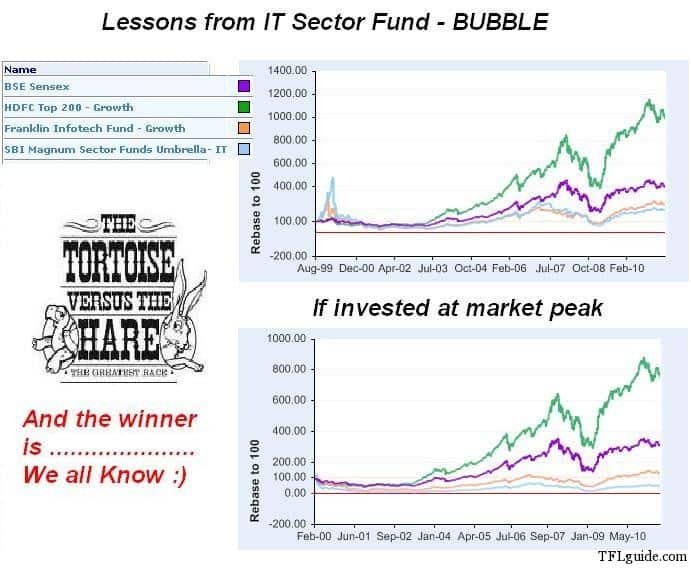 So, if your agent sold you an IT Fund in 2000 or Infrastructure related funds in 2008, probably you also had your “Biryani” as they have underperformed in comparison to the broader markets. 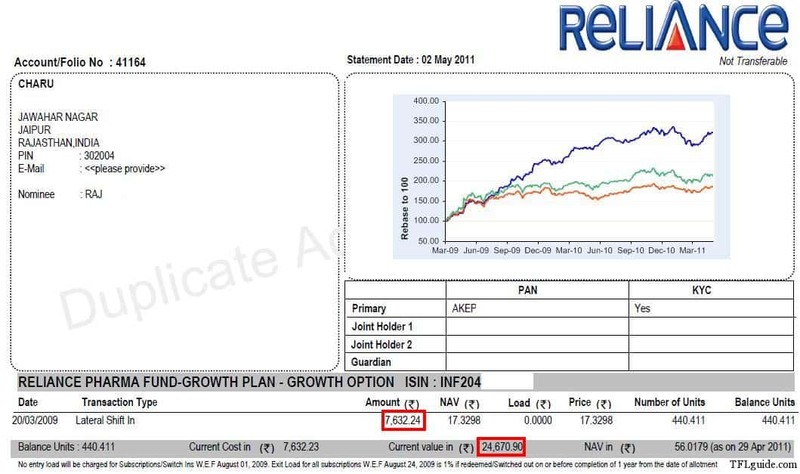 (Check image on left) One of my friends when approached me was sitting in Reliance Natural Resource Fund(Red) – we suggested him to move in Reliance Pharma(blue) & green line is Sensex. You can see how wrong selection of sector can have adverse impact on the portfolio. From Friends Account Statement. Theme Funds are not 100% diversified but include particular set of sectors. As infrastructure theme includes construction sector, banking sector, energy sector, power sector etc. If we talk about rural theme it will cover Fertilizers, FMCG, Chemicals etc. 2-3 instances happened recently which forced me to write on sector funds. Lot of people started asking us about “Silver Funds” or “Natural Gas Funds”. The biggest mistake our retail investors do is they try to catch train at the last moment. And in the end you only get to land in the Guards Cabin or the Luggage Room. The markets have already discounted the price of these assets (Silver, NG etc) but we want to invest in them NOW. When smart people are booking profits (and the non-smarts are still carrying their short contracts) the retail person wants to taste a new avenue. This is not directly related to sector funds but shows how people attract to fancy of the market. Recently one of our new clients asked for investment in some Pharma based fund & we said no, but actually few of our clients have exposure to it. I have done a case study for Business Bhaskar where this guy was having exposure to some Banking fund & I said to redeem it. 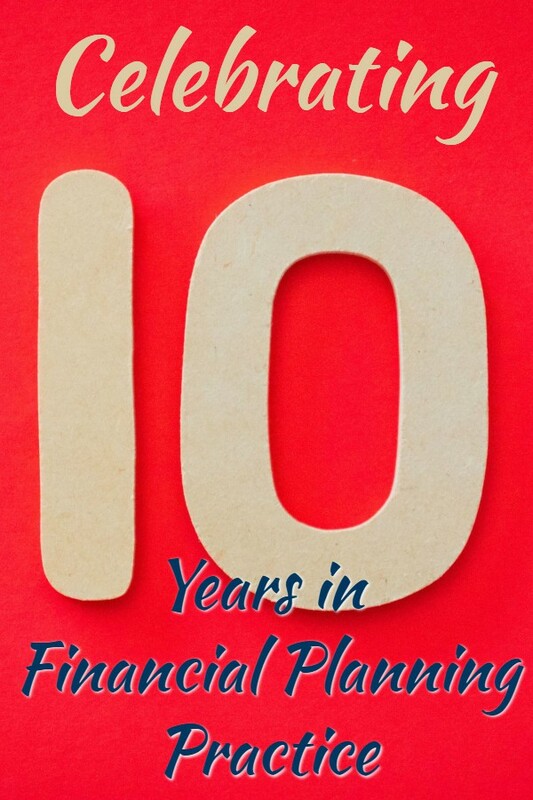 I got a furious call on the same day “Why you advised him to redeem Banking Fund – you nuts don’t you know it’s among the best performing funds & if India will grow banking sector will get benefited.” I just laughed & kept the phone down. Should you invest in Sector Fund? You should not invest in those sectors which are already heavy in your portfolio. If you talk about banking, it’s already 20-25% in every diversified equity fund – so when you add banking sector fund you are increasing risk. If you follow Shariah Rules or you would like to avoid particular stock for any other reason – you can construct your equity portfolio with sector funds. Sector Funds Vs Direct Stocks: If you have understood that you have to invest in particular sector you have 2 choices – either you go through direct route & buy 2-3 equity stocks or go through mutual funds. Now here comes benefit of diversification – yes diversification in stocks in that particular sector. Fund manager will be holding 10-12 good researched stocks in a sector fund – so you can take benefit of it. So if you are very sure of just 2-3 companies you should go directly to bourses but this surety would only come if you have researched the stock well. If you have not but still feel bullish on a particular sector or theme mutual fund is your way out. 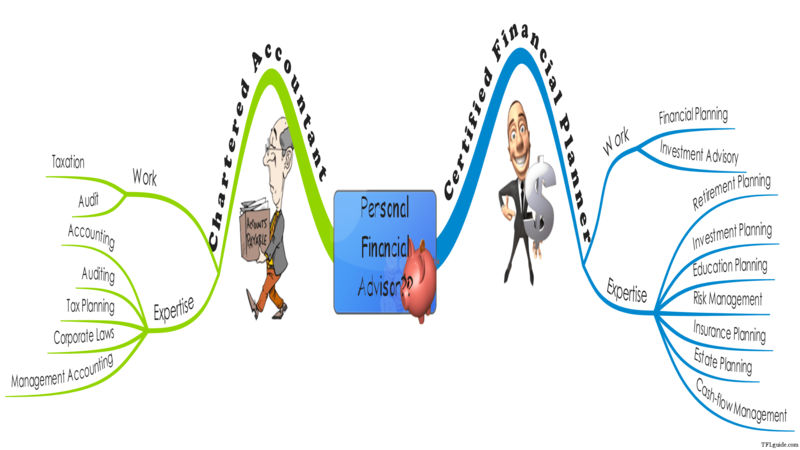 In Financial Planning, there are 2 school of thoughts, one which says that investor should invest a part of its portfolio in Sector Specific assets considering his risk appetite and the other thought says that one should stick to Diversified Funds as these fund will themselves tilt the portfolio towards a sector which is showing a potential of beating the broad markets. So I leave this to you to take a call. How many sector funds one should have? Sector funds work like Chris Gayle & Yousuf Pathan – when they perform you easily achieve the winning totals but when they don’t perform you should not feel sorry. One thing is clear we should have a balanced team & we can’t have 11 Gayles on one side. Know your limit while adding sector fund. Have you ever invested in sector or theme funds? What was your experience? It truly shows that you have done lots of research before writting this article ! During 2007-2008 (start) … i have invested in infrastructure and energy funds … and most of them are still bleeding…. I have one question regarding the mode of investment in sector funds.Some advisors suggest only lump sum investments at the correct time and do not favour SIPs in sector funds.I have also gained from this approach.I invested lump sum amounts in some sector funds when the sensex was around 17500.My investment has grown in all sector funds now.On the other hand most of my SIPs in diversified equity funds are showing negative returns. But I must tell & I have shared in 1st para of article – these are very risky funds & only purchased after thorough research. 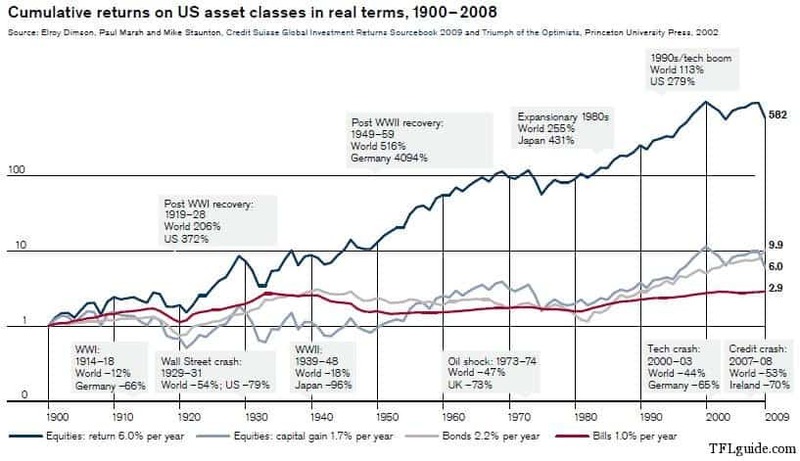 It’s like we are trying to beat fund managers and I clearly believe we can’t in long term. We were right this time but there is no guarantee that we can repeat the success. In such cases always keep your bets small. Recently I have read one article in a leading Personal Finance Magazine.As per the author, FMCG and Pharma are very defensive sectors with low risk. The author suggests that investors with low risk appetite can consider investment in these sector funds. I think you need to give time to diversified equity funds. They will reap very good dividends in long run. For sectoral funds , it is high risk high return investment. No one can time the market , so no one knows what level of Sensex is optimal for investment.So a SIP is suggested.On top of this investment , you can invest lump sum amount in staggered manner when market tanks. But again its for high risk investors. I agree with you – people should stick with diversified equity funds. Thanks for your advice.Core of my portfolio is made of SIPs in diversified equity funds.My investment in sector funds is very small and is made only in lump sum when the market tanks considerably. Thanks for sharing the information, Hemant. Very useful article! 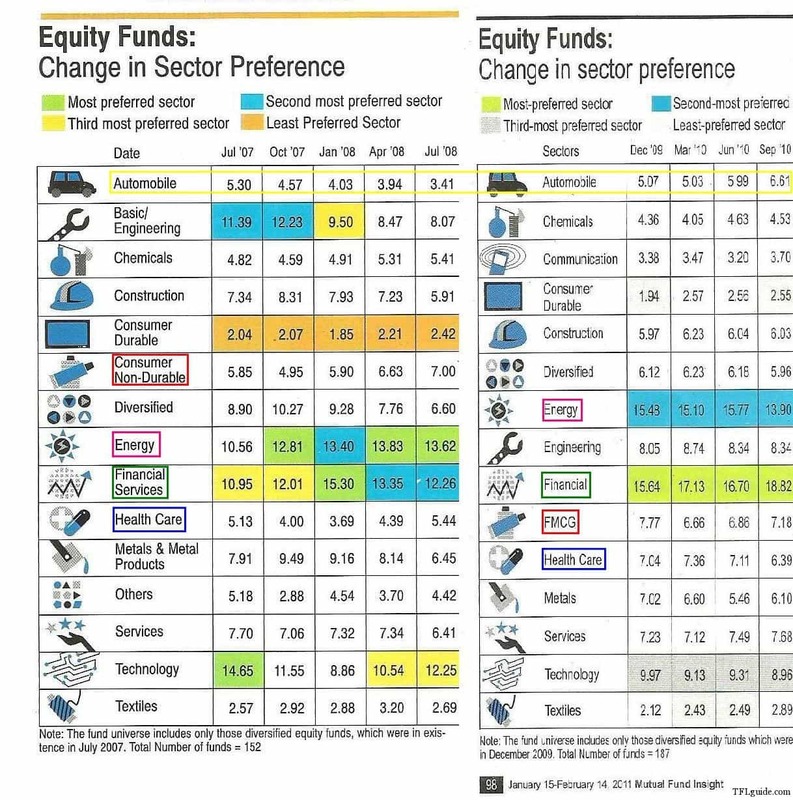 Another fantastic analysis from u about sector funds.. I have started investing Rs. 4000 per month in HDFC tax saver for IT purpose.. i want to invest 2000 per month SIP in diversified funds. I have seen many of ur posts in which u talked about this n have suggested HDFC top 200 n DSP BR top 100 funds.. Yesterday I went to both Mutual fund offices n talked about my investment..HDFC person told me that HDFC equity fund is better than top 200 as it has given a touch better returns over the years n i have also checked performance chart where it is true that HDFC equity fund performed better..
Coming to DSP BR person.. he told me that DSP BR top 100 is good if u invest lumpum amount..If u want to invest in SIP format then go for DSP BR equity fund.. I want your views on this Hemant..as i m not sure wht to do.. Do you see any logic in what they have said or its a marketing strategy? Please let me know only one good fund for SIP out of these 4 that I have mentioned above.. I have SIPs in both HDFC Equity and HDFC top 200. No doubt the returns of HDFC Equity are definitely better than that of HDFC top 200.HDFC Equity being a multicap fund is slighly riskier than HDFC top 200 which is a conservative type of fund.If you have risk appetite go for HDFC Equity.Otherwise go for HDFC top 200.Both funds are quite good. Since you have already invested in HDFC tax saver, for the sake of diversification you can select DSP Blackrock top 100.SIP is always preferable particularly in choppy market conditions. Thanks Anil for your info..I will try to go for HDFC equity fund based on performance n also it has been rated as the best fund in year 2010.. I know that DSP BR top 100 has done well in the last few years but DSP BR is not the brand that will allow me to have a good sleep at night..HDFC is something that I know n since Equity fund is going on well since 1995..i prefer going for it.. If Hemant is looking at this..I wanna know his views too.. I am happy to see that you guys are developing your thought (investment) process. Doesn’t make much difference that you go for HDFC Top 200 or HDFC Equity – ask that AMC guy to give in writing that X will perform better than Y. One of them is large cap & other is multicap so depending on your portfolio you can choose them. You may wish to touch upon sector rotation funds. Are these available in India now? I think there are 2 funds on this theme one from Principal & another from Sundaram but both are not doing good. 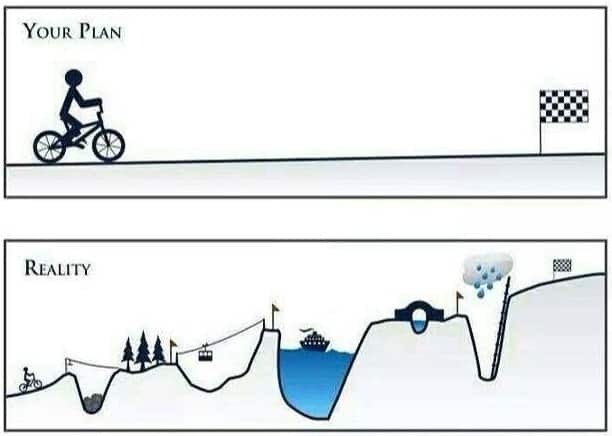 My experience is mixed.Three years back when I had absolutely no idea of investing in mutual funds,I relied solely on the wisdom of relationship manager of my bank.He started my SIP in ICICI Prudential Infrastructure fund.My SIP is still continuing though the returns are nominal.On the other hand, I have myself made small lump sum investments in some of the funds included in your list whenever the market has substantially tanked and so far I am satisfied with the returns. Thanks Hemant.I agree.I think now I should exit ICICI PrudentiaL Infrastructure Fund. The Cavalcade of Risk 5th Anniversary Edition is up, and your post is in it. Thanks a ton for your previous reply.. I would like to divide my amount of SIP to 1000 each in Reliance growth fund which has done as well as HDFC equity..just for a case of diversification..
Also let me know which is the best mutual fund to invest in lumpsum in case the market crashes as it did couple of yrs back.. Can u name 1 or 2 ? Just now I have received my Portfolio Valuation from CAMS and KARVY.It shows a decent growth for my lump sum investment in ICICI Prudential Discovery Fund and HDFC Midcap Opportunities Fund made when the market had tanked..On the other hand return from Reliance Growth Fund has been very poor.Perhaps you can consider these funds if they can fit in your portfolio.I am thinking of exiting from Reliance Growth Fund. Thanks Anil for the info on investment of lumpsum funds..n I have seen the SIP chart that Hemant has posted many days back on the 10 best SIP funds n the list says that Reliance growth fund has given the best returns..Dats y it is getting harder for me.I made my mind to go with SIP’s n now the confusion is which 2 that i need to choose out of 5..
ok..i think i finally made my decision..after analysing all the facts.. n considering my age of 26..i decide to go with Rs. 1000 each with HDFC top 200 n DSP BR equity fund.. Sorry, i did not go with DSP BR equity fund.. I went with a more aggressive fund which has also been doing well since last 3 yrs as i can afford some risk..i.e DSP BR small n midcap fund.i hope it is also a good fund..so now i have one large cap fund i.e HDFC top 200 n one mid cap DSP just for some diversification.. I would like to know which school of thought you belong to as far as investment in sector funds is considered.Please explain what you mean by the following. Thanks! I have exited from ICICI Prudential Infrastructure Fund. I made small lump sum investments in FMCG and Healthcare funds when the market tanked recently to 17500 level. My SIPs in mainstream funds are continuing. Yes Anil, I agree..Lumpsum investment when the market tanks is one of the better ways to invest in sector funds. FMCG, Pharma and Banking have performed exceptionally well in the last few years whereas Infrastructure sector have disaapointed in the last 4 years. However most of the experts are saying that Infrastructure sector will start performing in the next 6 months time n it can better the other sectors too..Only time will tell..
Thanks.Yes,most experts think that there will now be only two more hikes in the interest rates by the RBI and after that interest rate sensitive sectors will start performing.Let us wait and watch. I don’t know about the cycles – will they be 3 years or 30 years. Sector funds can five -90% return to even +1000% return – this we have already seen in past. Fasten your seat-belts if you have significant exposure to sector fund. 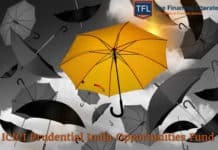 I think booking timely profits from sector funds can be an option and investor can re-invest the profit in its core portfolio holding of diversified mutual fund portfolio. It again depends from investor to investor.Some investors are comfortable enough to treat it any other Mutual Fund through SIP and keep investing for 5-10 years horizon. For instance , you wont be complaining if you had invested regularly through SIP in funds like Reliance Banking and Reliance Pharma since their inception.Excellent returns. It is difficult to say whether this return can be sustained over a longer period.However, there is no harm provided the exposure is not very high. I am 21yrs old and started my investments recently.I have started investing in UTI dividend yield plus and quantum long term equity,both through SIP’s.I want to invest in HDFC equity and reliance pharma and IDFC small & mid cap,all through SIP’s . Is it a right thing to do.Please help me out. While constructing your mutual fund portfolio you should adopt core and satellite approach. 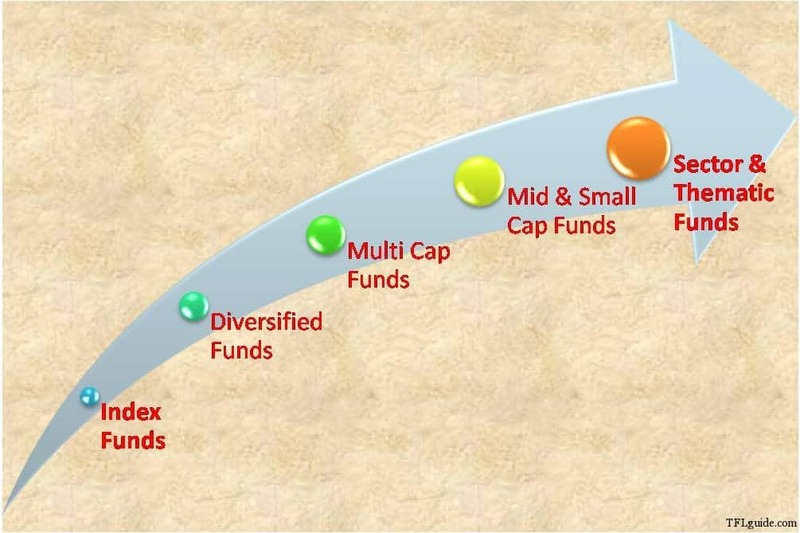 The core should have exposure to large and large and midcap funds. Satellite can have exposure to multicap funds, mid and small cap funds ans sector funds.The funds you want to invest in should be in satellite. Before this you must have a strong core. Hence you should invest in funds like ICICI Prudential Focused Bluechip Equity and DSPBR Top 100 etc before going for satellite funds. 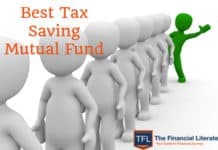 Please read the post-Best Mutual Fund For SIP for further information. RELIANCE PHARMA : RS 1000. 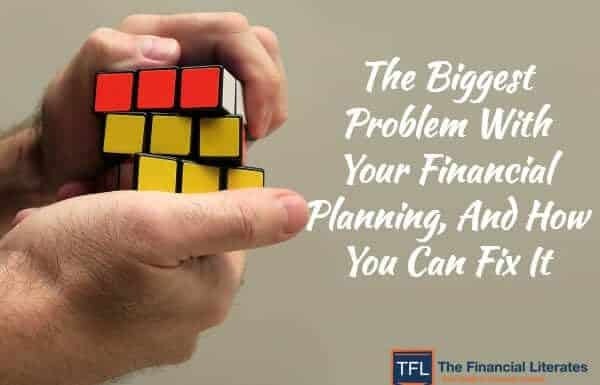 I think you need to understand the risk associated with thematic funds and invest accordingly. FMCG has done exceedingly well this year and pharma though has been a steady performer. I will advise you to increase allocation to ICICI Pru Focussed Bluechip Equity to 3000 and give Reliance Regular Savings a miss. 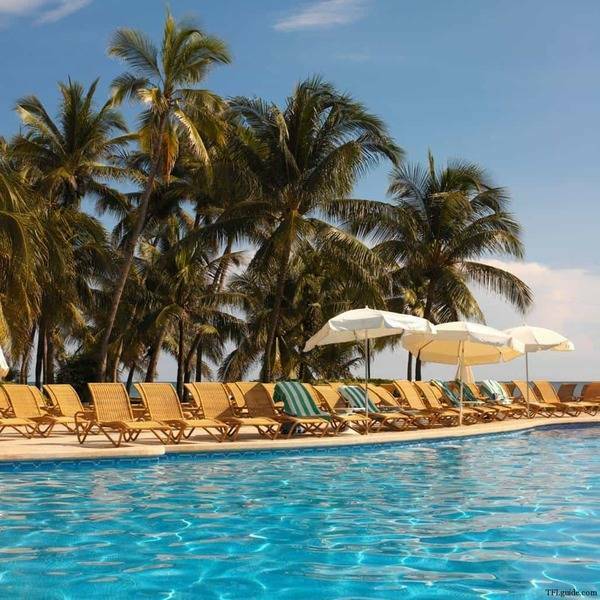 I would like to make a one time investment for 2 lacs. Could you pl suggest should I go with sector fund or opt for balanced fund. Pl recommend the MF name as well. Time horizon is 5-10 years. 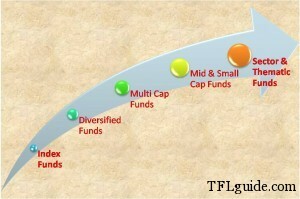 Diversified equity or balanced fund are better in comparison to Sector Funds. i have following sips- RS.2000 each in 1) uti opp 2) hdfc midcap 3) sbi emerging bussiness 4) reliance banking 5) icici FMCG ….. 6) 3000 in CAN rebeco infrastrur 7) 1000 in birla mnc fund & 8) HAVE ICICI FOCC BLUE CHIP FOR BULK INVEST MENT …. at present i have 40 % in large cap , 30% in mid cap & 20% in banking fund… i also invest in gold coins & some debt instruments (7000 per month)…. I will double my sip in uti opp & birla mnc & start a sip of 4000 in icici focc blue chip by year end…. please send your valuable comments….. please reply…. please guide me….. Thanks Hemant. Great effort taken by you to explain sector funds. Besides the article the comments and queries from different visitors of your blog help to understand the concept with so many good examples. I feel really good after reading articles on TFL. Thanks Guys for such valuable info.. Need your expert advice on two SIP. 1. Reliance power diversified mutual fund: I have a monthly SIP of Rs.3000 for last 29 moth and as on today I am at a loss of Rs.14,000. Should I continue considering the huge loss. If answer is Yes to discontinue, please suggest a good SIP as on date. 2. 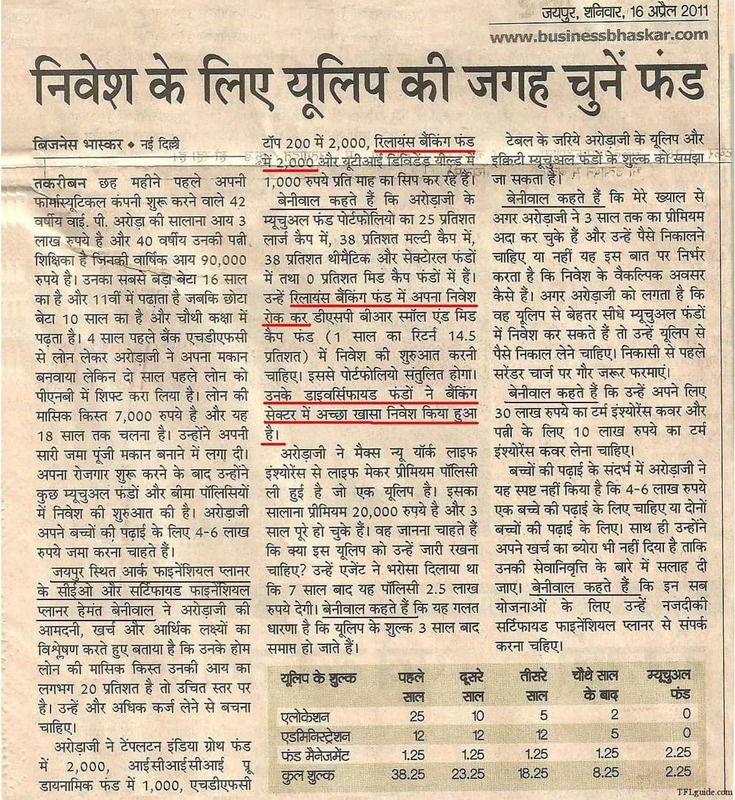 Birla Sunlife growth: After Rs.3000 for 28months investment, there a negetive return of Rs.3000. Should I continue considering the huge loss. If answer is Yes to discontinue, please suggest a good SIP as on date. For exiting from any scheme you need to analyse on certain parameters such as the performance of the scheme with its peers, the sector outlook, the change in objective of the scheme if any, and others. Once you have analyzed on these you will come to know whether exiting the scheme and incurring loss is more viable then holding it. I want to invest in pharma fund. 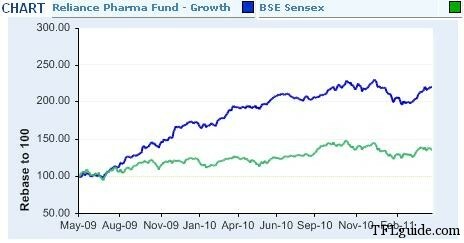 Can you please advice if there is any good pharma fund to invest? The list and performance is mentioned in the article. Nice Article, simple and logical. I have a portfolio in which I am investing 2000/- per month for each fund from last around 2 years. I will like to know your valuable comments on it. Read below to know more on creating an investment portfolio.. I have been studying your blog from one month. Wonderful knowledge i have been taken from them about stock market and mutual funds. I felt very happy to meet you through this blog. Now come to point, I have invested in RNRL fund Rs.20000 in the NAV of 10/- ( while i did not know anything at that time about that fund.) 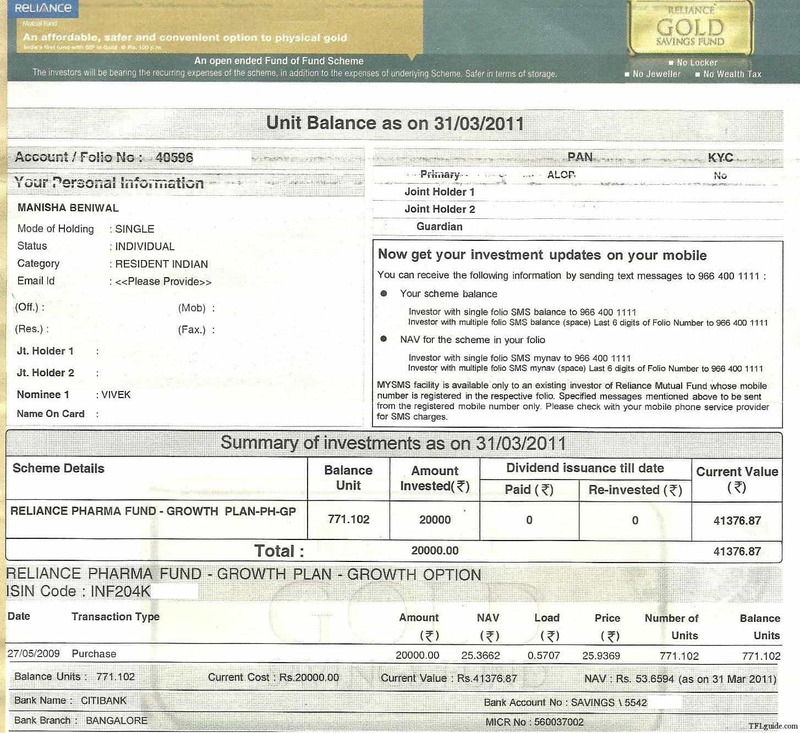 I withdrawn same amount in the year 2012 without single rupee profit. I have an to invest in MUTUAL FUNDS within 3 or 4 months in SIP mode. I will contact you later with my full profile. Could you please let me know which fund to choose in large cap category. Currently I have started investing in Quantum Long Term Equity and Religare Equity Fund in SIP mode. How good or bad is my fund selection. dear mr.hemant my above total invest ment is 3.43 lak as on date and presnt value is 7.31 lak pls guide me which fund i should exit,retain or increase the amount of investment my goal is 20 lak by 2020.